I approach personal training from a completely different perspective. Similar to how personalized medicine is revolutionizing the world of health care, I believe personalized, custom-designed personal training will lead to optimized results for my clients. 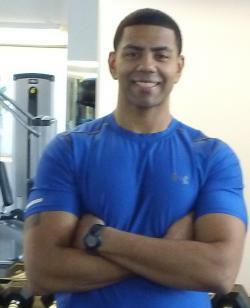 As your personal trainer, I begin by conducting a thorough review of your goals, strengths, and limitations. Based upon your feedback and current abilities, together we create a personalized program which will be designed to help you meet or exceed your goals, overcome your limitations, and challenge yourself to reach new levels in personal fitness. I believe no two clients are alike and, therefore, no two programs should be alike. My mission is to educate, motivate, coach, and inspire my clients to reach their fitness potential. Whether you’re first beginning your training program or have been working out for years, working together we will evolve your exercise regimen to ensure continual progress. You will never be bored! Growing Up I was always very active and involved in playing sports however, I was overweight and not in the shape I wanted to be in. When I reached the age of 20 I became interested in fitness and began to change myself from the inside out. I began with the basics of traditional weight lifting and evolved to a complex integrated method of training using my knowledge and athletic background. I have now been in the fitness industry for eight years and have enjoyed playing a role in changing peoples lives by helping them reach there fitness goals. I attend many seminars, conferences, and classes yearly to further my knowledge base and provide my clients with the latest training methods.